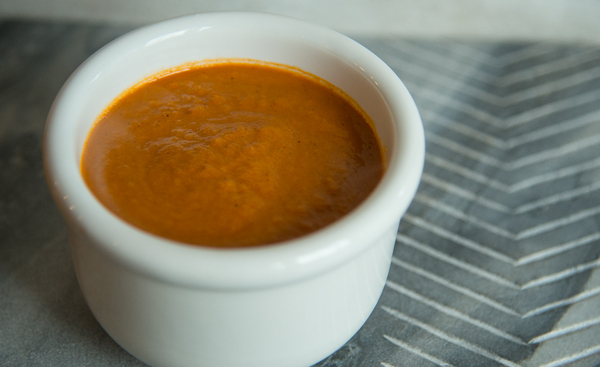 Some people may question the sanity of posting a soup recipe in the “dog days” of summer, especially those in places where the temperature normally exceeds 90 degrees. We’ve been fairly lucky this year in terms of having a hot summer. The Washington, DC, area can usually be compared to a steam bath around this time, but this year has been different, and, I must say, there will be no complaints from me. I love fall and it’s usually this time of year that I start thinking about that first morning I walk outside to discover a telling crispness in the air. Meanwhile, we still have a couple of summer months left and lots of summer produce to use up – tomatoes anyone? 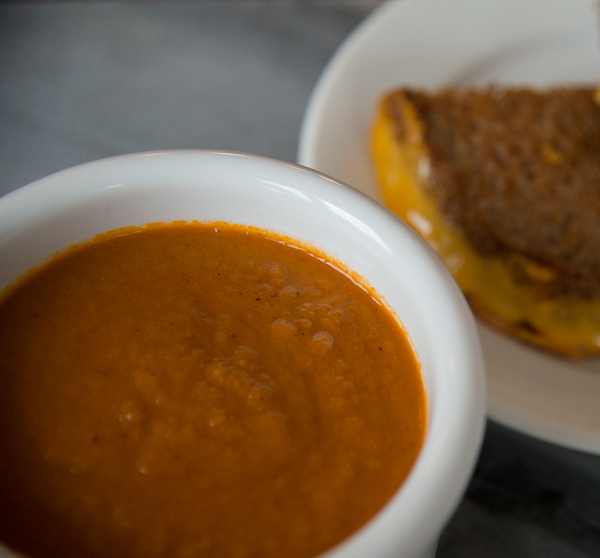 Tomato soup is one of my favorite foods, and if you pair the soup with a grilled cheese sandwich, it’s a total win, win. How do you like your grilled cheese sandwiches? I prefer a fairly dense country style bread because it can hold more cheese that way. I spread the bread with a combination of mayonnaise and strong mustard and then add the cheese, usually whatever I have on hand. Lately it’s been cheddar slices, but any kind will do. I also add some ham, if I have some and maybe some thinly sliced pickles. Butter up the outside of the bread and fry it until crispy. Yum, yum! In this soup recipe, you roast all the vegetables before making the soup, which adds a wonderful smoky flavor. Don’t be afraid to get some char on the vegetables; it adds to the depth of flavor. I kept this soup on the rustic side, by just giving it a spin in my Vitamix. But if you prefer a smoother creamier soup, you can put it through a fine strainer before adding the cream. 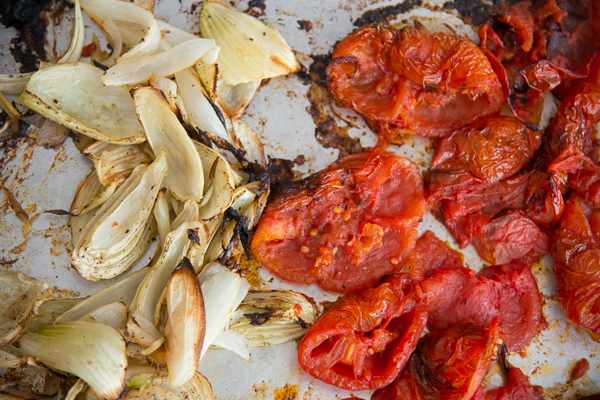 Halve the tomatoes, squeeze out the seeds and place cut-side up on half of a sheet pan or baking sheet. Trim the stalks and fronds from the fennel, reserving some of the fronds for garnish. Cut the fennel in half lengthwise then in half again and remove the core. Add the fennel and the onion pieces to the other half of the sheet pan. Drizzle the vegetables with olive oil, season with salt and pepper, and toss with your hands to coat. Roast the vegetables for 40 minutes, stirring occasionally, until tender and carmelized. Remove pan from the oven and allow to rest for 10 minutes. Place the vegetables and the broth in a blender and puree until smooth. You may need to do this with half the vegetables and half the broth at a time. Transfer the vegetable mixture to a large saucepan. Add the bay leaves and more salt and pepper to taste. Bring to a boil over medium-high heat then lower heat to a simmer and cook 15 minutes. Hint: Now is the time to prepare your grilled cheese sandwich if you are making one. Remove the bay leaves and stir in the cream, if using it. To serve, ladle the soup into individual bowls and garnish with fennel fronds. 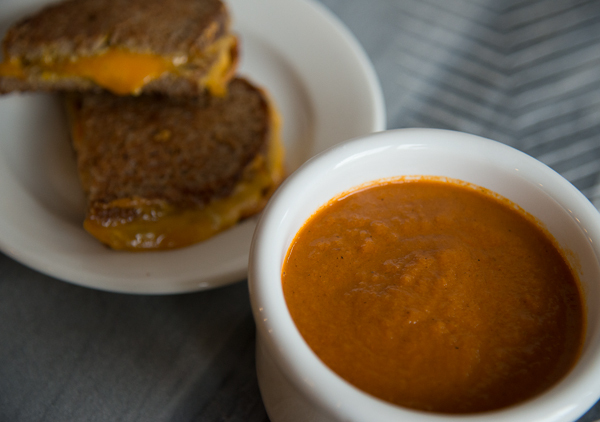 This entry was posted in Soups and tagged Fall, Fennel, gluten free, grilled cheese sandwich, Paleo, Primal, soup, Summer, Tomato soup, Tomatoes, Vegetarian by Jeannine. Bookmark the permalink. Good Lord Jeannine! Can’t wait to try it! You are a Jedi Master! Something to try for grilled cheese is apple strudel bread (Costco). Sounds weird, but, tasty.